As we all know Ganeshotsav is already started in the country and on the 11th day we immerse idols in the river, but due to our traditional way of immersion, our rivers have become very contaminated. Our traditional way of Immersion of Idols not only pollute our rivers badly, It also disturb the marine life. Governments of various states are promoting Eco friendly idol immersion from years and from last few years devotees are also trying to make the celebration as much as they can environment friendly. To overcome this situation, Vodafone India, a leading telecom service providers, has launched a unique initiative for all Lord Ganpati devotees. 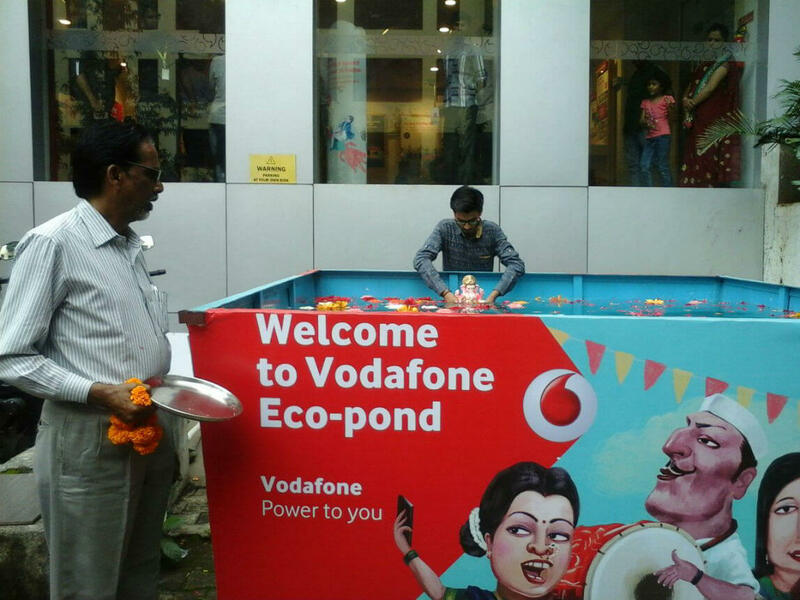 Vodafone unveiled its Eco-Ponds on the occasion of the 125th anniversary Ganeshotsav celebrations in the Pune City. Vodafone's Maharashtra & Goa circle has partnered with Pune Municipal Corporation (PMC) and National Chemical Laboratory (NCL) to help citizens across the city celebrate and immerse Ganesh idols in an environment friendly manner. The key idea for this initiative is to dissolve the Ganpati idols in the pond such that people do not immerse it in the river bed, which eventually pollutes the river bed and disturb the marine life equilibrium. How Vodafone Providing Eco-Friendly Idol Immersion? 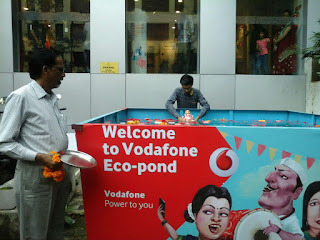 Vodafone has set up 'Vodafone Eco-Ponds' on 8 stores across the city to facilitate the environment friendly immersion . These ponds are basically temporary water tank equipped with a promoter and a life guard. Pune residents can visit any of the stores with their Ganesh idols, where they will be assisted to carry out the Visarjan. These tanks are fitted with IOT device that helps track the water level in it once the Ganpati idol is immersed. Vodafone Eco-Ponds are placed at Vodafone stores located at JM Road, Hirabaug, Wakdewadi, Aundh, Karve Road, NIBM Road, Kalyaninagar and Kharadi . 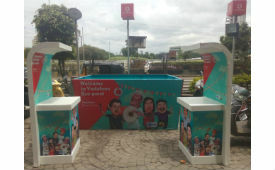 Additionally, the Vodafone also plans to set up a Mobile immersion Van, which will be visiting select large housing societies, old-age homes, where it would provide visarjan facility exclusively to the residents of the society. 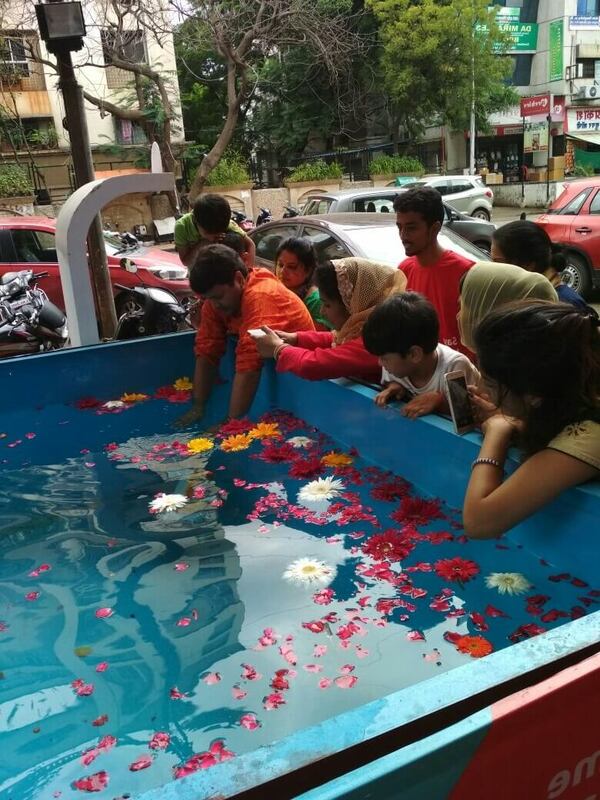 To know more about Mobile Visarjan Vans or nearest stores equipped with Eco-Ponds, devotees can also dial Vodafone special helpline number 7391000000.